The 15th century Virgin of Jerusalem icon, as many religious icons, is better analyzed in terms of its prototypical qualities than rather the individual object. 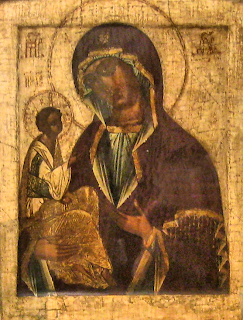 This is not only because the artist is unknown, but also because of the difficulty in identifying the object as unique amongst other Virgin of Jerusalem icons from the 15th century in the Novgorod school style. Considering this, I will analyze three aspects of this icon as they relate to its specific nature as a religious item that follows a prototype than rather an individual unique work of art. To begin, I will provide an introduction to the artist, or in this case, the historical account of the prototype's creation along with the origins of the style to which the actual painter of this replica would have subscribed. Following, I will consider the formal qualities of the work - how does this work present itself aesthetically and why? How do the work's formal qualities relate to the style associated with it and how is it a testament to the period's artistic expression? Finally, I will describe the iconography found within this religious icon. What do the different elements of the icon mean and what do they try to convey? I will look both at the direct meanings found within the presentation itself (letters, gestures, symbols) and at the more indirect ones (religious importance and meaning). First, it is useful to go over a short introduction to the icon's creator. This can be divided into two parts: the creator of the prototype upon which this icon is based and the artistic movement (the Novgorod school) within which the actual icon was created. While there are many icons of the Virgin and Christ in Christianity, they fall within greater prototypical guidelines that define an aesthetic for categorizing them. In the case of the Virgin of Jerusalem, the prototype of the Hodegetria (She who shows the Way) was used. Further, according to Byzantine tradition, the original Hodegetria was painted by the biblical Saint Luke and was blessed by the Mother of God herself. But while there are many reproductions in the Hodegetria style, some (like the Virgin of Jerusalem) are consecrated due to the 'appearance of a miraculous icon' and begin to be reproduced under a new title. In fact, many list Saint Luke as the painter of the original Virgin of Jerusalem as well and trace its story throughout history from biblical Jerusalem, to Constantinople, to Novgorod, Moscow and to its final resting place at the Notre Dame cathedral in Paris. Regardless of the original's origins however, there are also the reproduction's origins, which are traced to 15th century Russia and the city of Novgorod. As Russia's cultural centre around the 13th-14th centuries, the city of Novgorod and the artistic school of icon and mural painting that flourished in and around it during the 12th-16th centuries formed the basis for Russian art. Eventually the Novgorod school gave way to the Moscow school at the end of the 16th century, but there is still a great and distinct body of work (like the Virgin of Jerusalem icon) produced in the Novgorod school style. Subjective aesthetic merit aside, however, one must consider the iconographic qualities of the work - what does the work mean to say and how does it accomplish saying it? The name Hodegetria from the greek Οδηγήτρια "She who shows the way" means 'Directress' or 'Guider of the Way' and can be understood as the mother of god directing Christians to Christ and the church and guiding them in the right path. Further, the Greek letters ΜΡ and ΘΥ on the sides of Mary's head are an abbreviation for the 'Mother of God', IC XC above Christ's head the abbreviation for 'Jesus Christ' and ώ Ό Ν in each of the bars in Christ's halo mean 'he who is'. While the abbreviations are used for identification of the characters depicted in the painting, the letters in the halo have a more existentialist and assertive meaning by which Christ is essentially confirming his existence and asserting his divinity. The gestures of The Virgin and Christ also have symbolical meaning. The Virgin's hand is raised towards her chest in what looks like a gesture of prayer, but also one of presentation - she, as a sovereign, is presenting her son to the world of the faithful. In turn, Christ the child, 'full of wisdom despite his young years' responds to his mother with a 'broad majestic gesture of benediction.' In essence, every aspect of the icon is designed to at once educate and dictate the church doctrine of the time, that is, the supreme power is that of the church, embodied by Christ and the Virgin Mary represented in the icon before the viewer. In conclusion, we have observed that the 15th century Novgorod school Virgin of Jerusalem icon is a replica of the original Virgin of Jerusalem icon which in turn is based on the Hodegetria prototype. While the historical origins of the prototype are traced to biblical times and Saint Luke, the actual painting is a product of a 15th century religious art movement from around the city of Novgorod in North-Western Russia. We have also seen a few characteristics of the Byzantine religious icons and the Novgorod school in particular as well as some key differences between the Virgin of Jerusalem prototype and its master prototype the Hodegetria. Finally, we looked at the meaning imbued in the icon. From the more direct symbols like the Greek letters denoting the characters depicted and their divinity, to less direct symbols like their stance and gestures, telling us about the ways Orthodox Christianity used to communicate with its disciples. Regardless of subjective aesthetic considerations, this work is an excellent example of not only how art was viewed in that time and place, but also an important historical document teaching us about much of the ideas and influences present in the unique cultural milieu that was the Byzantine world. Maskell, A. (1884). Russian Art and Art Objects in Russia: A handbook to the reproductions of goldsmiths' work and other art treasures from that country in the South Kensington museum. London: Chapman and Hall, Ltd.
Ouspensky, L., Lossky, V., & Kadloubovsky, E. (1982). The meaning of icons. Crestwood, N.Y.: St. Vladimir's Seminary Press. Wilson, T. (Ed.). (2007, October). Icons of the Most-Holy Theotokos. The Voice in the Wilderness , 6 (2).